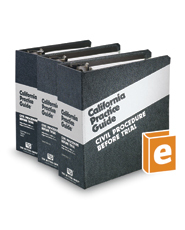 Civil litigation experts offer invaluable practice pointers in Civil Procedure Before Trial. This set includes step-by-step pretrial procedure guidance, beginning with client intake and continuing through commencing the action and bringing it to trial. This practice guide contains detailed coverage of jurisdiction, pleadings, motion practice, discovery, and more. Citing the latest cases available, plus statutes and rules of court, this litigators' bible includes proven strategies, tactics, time-saving tips, and illustrations. It develops each topic and procedure so you know when, where, and how to proceed.